Alice Morgan Wright (Albany, New York, October 10, 1881 - Albany, April 8, 1975) was an American sculptor, suffragist, and animal welfare activist. She was one of the first American artists to embrace Cubism and Futurism. Wright came from an old Albany family. She was a student at St. Agnes School in Albany (now Doane Stuart School). A graduate of Smith College, she continued her studies in New York City. Prohibited from attending life studies while attending the Art Students League of New York, Wright watched local boxing and wrestling competitions in order to study the human form. In 1909, she went to Paris, where she attended the École des Beaux-Arts and the Académie Colarossi. In Paris she was a pupil of Injalbert and in New York she studied with Gutzon Borglum, James Earle Fraser and Hermon Atkins MacNeil. She exhibited domestically at the Art Institute of Chicago and the Art Institute of Philadelphia, and her work appeared in Europe at the Royal Academy of Arts (London) and the Salon des Beaux Arts (Paris). She was a member of the National Association of Women Painters and Sculptors as well as a founding member and director of the Society of Independent Artists. Wright's years back in New York City were extremely fruitful. She won many awards for her work, including the Gutzon Borglum and the Augustus Saint-Gaudens prizes. "The Fist," perhaps her best known sculpture, shows the modernist influence of Auguste Rodin; other works, like "Medea" (1920), integrated avant-garde Cubist and even Futurist elements. But Wright also produced more conventional pieces throughout her career. Betsy Fahlman curated a retrospective exhibit of Wright's work in 1978 at the Albany Institute of Art and History. Wright's extensive personal papers are open to researchers at the Sophia Smith Collection, Smith College. Wright was a member of the National Sculpture Society. She exhibited two pieces, Wind Figure, a stone carving and Young Faun, a bronze statuette, at the Societies 1923 exhibition. Her very abstracted work Medea was shown at the 1929 exhibition. Wright was also an ardent suffragist. She helped to bring the charismatic Emmeline Pankhurst to a speaking engagement in Paris and felt inspired to go to London herself to join the suffrage movement there. With the National Women's Social and Political Union, she participated in militant demonstrations in England. She was incarcerated for two months in Holloway Prison, London. With other suffragettes, she protested her treatment by participating in a hunger strike. She also used smuggled plasteline to model a portrait bust of her fellow prisoner, Pankhurst. Wright continued her suffrage activism after her return to the United States in 1914. She was Recording Secretary of the Woman's Suffrage Party of New York during the winning campaign. In 1921, she helped to create the League of Women Voters of New York State. In 1920, Wright returned to Albany and gradually turned away from art to focus on political activism, especially animal rights. 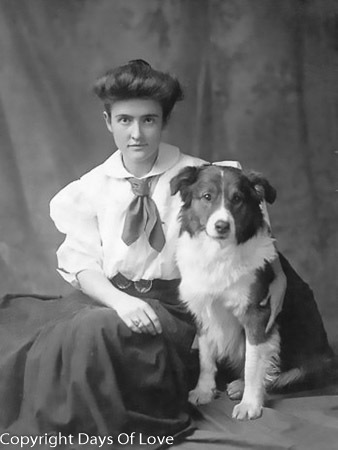 With Edith J. Goode, she founded the National Humane Society, later renamed The Humane Society of the United States. Wright and Goode were lifetime companions. Goode was born in Springfield, Ohio, and raised in Washington, D.C. Edith attended Sidwell Friends, at that time a small Quaker School, then attended attended Smith College (graduating in 1904) where the two women ment, and together they worked tirelessly for peace and justice. Goode was a member of the Women's International League for Peace and Freedom and co-founder of the National Woman's Party.